Using the Inverse Kinematics tool, if you pull a hand the system will animate all of the character's parts included in the hierarchy chain; the torso, the hips and the legs, depending on your rig. Often, you will only want to animate part of a character, such as the arm and not the whole body. To do so, you need to make use of IK constraints such as IK nails that are used to temporarily cut or constrain the chain. IK nails can be used to cut an IK chain or to block a part on the spot. For example, you can fix a character's feet to the ground when he walks. Blocks the X, Y and Z positions. Sets limitations on the angle parameter to prevent the puppet from bending too far. 3. In the Camera view, [Ctrl] + click (Windows) or [⌘] + click (Mac OS X) on the part to set a nail on. 4. In the Tool Properties view, click on the type of nail you will use. ‣ You can also hold down the [Shift] key and click on any part's pivot to set a regular nail on it without having to select it. 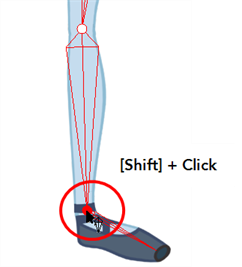 ‣ You can hold down the [Shift] key and click on the bone to set a Hold Orientation nail. ‣ You can select the nail type in the top menu by selecting Animation > IK Constraints > the desired nail. ‣ You can remove the nail at anytime using the same technique you did to place the nail. It will not affect the animation. 5. To remove every nail except the Enable Min/Max Angle ones, in the top menu select Animation > IK Constraints > Remove All Constraints.